Chinese investors have promised to invest 300 billion rubles ($5 billion) in the construction of the Moscow-Kazan high-speed line, planned to form part of the Moscow-Beijing high-speed route. The new financing could help to revive the project, which has been at a standstill since 2012. China plans to invest 300 billion rubles ($5 million) in the construction of a high-speed railway from Moscow to Kazan. Of this sum, 250 billion rubles will come in the form of 20-year loans from Chinese banks. According to business daily Vedomosti, the Chinese side discussed the financial details of this project with a representative of the Russian delegation at a meeting behind closed doors during the Boao Forum for Asia 2015. Earlier, Alexander Misharin, first vice-president of Russian Railways, said that project financing would be offered in two currencies – rubles and yuan, writes the newspaper Kommersant. This project is more than just a promising idea – according to Misharin, for the state, the payback period of such projects is five to seven years. The 770-km Moscow-Kazan section is being considered as part of the Moscow-Beijing Eurasian Transport Corridor. An additional track could also be built through Kazakhstan or through the Altai, according to Russian Railways. 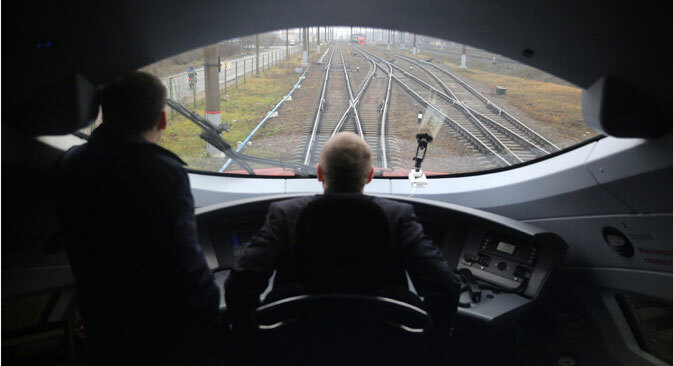 It will be the first line in Russia designed for trains operating at speeds of 200 to 400 km/h. China’s proposal could help break the standstill in the construction of Russia’s first high-speed railway. Since 2012, when Russian Railways first proposed the idea, the government has failed come up with financing for such a project. An understanding that the issue could be resolved with investments from China appeared only in October 2014, when China’s National Development and Reform Commission, the Chinese Railways Corporation, and the Ministry of Transport and Russian Railways signed a memorandum on the construction of a global project – the construction of the Moscow-Beijing route. This is when Chinese investors began to show interest in the Moscow-Kazan high-speed section – as part of the Moscow-Beijing high-speed route. Among the potential partners of Russian Railways are the China Investment Corporation and the CREC Construction and Engineering Company, as well as one of China’s largest manufacturers of railway trains, China CNR Corporation Limited. Despite the fact that as of today, over 26,000 km (16,000 miles) of high-speed railways are already operating in the world, and another 13,000 km are currently under construction, Russian officials have been dragging their feet on this issue. For a long time the government was engaged in a debate about whether it was necessary to finance such a costly project from the state budget. This all led to Vladimir Yakunin, president of Russian Railways, in February 2015, threatening that he would abandon the project altogether if the government failed to allocate to his organization the first tranche of 6 billion rubles ($10.3 million) in the first quarter of 2015. In response, the Ministry of Economic Development proposed that Russian Railways participate in the financing of this project on an “approximately 50/50 basis.” Later it became known that the railway monopoly had agreed to meet the government halfway, and find the 3 billion rubles needed. Obviously, the attraction of investments remains the “weak point” in the Russian economy, even during a financial crisis. At least, judging by the reports in the Russian press, it can be concluded that the extended helping hand from China could not have come at a better time.